“Excellent condition, works and sounds great. “Includes converter for power cable, since this is a Japanese model. 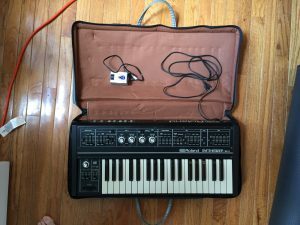 “Up for sale is my Roland SH2 Synth. Fully working, all keys, sliders, switches work fine and clean audio output. Master volume needs contact cleaning, if I have time I will clean it before shipping. CV and gate input and output, external audio in. Works on 220 to 240 Volts. “This is a rare vintage Roland SH-2 Analog Monophonic Synthesizer. I bought this keyboard new circa 1979 and have been the only owner. I used it as my lead synth for 10 years in the 1980s. Since then it has been in my closet for the last 25 years. ISSUE 1: The VCO-2 oscillator does not appear to be working. That part may need to be replaced. ISSUE 2: The bender lever only really works well in the down direction. When you try to bend it up, it sounds scratchy and unpredictable. It just may need to be cleaned, but I wouldn’t be surprised if that switch needs to be replaced. “This is a great synth, do not want to sell, but need the funds etc. Was imported from Japan years ago, great cosmetic condition and also in excellent working condition. This is built like tank. – Roland SH-2 Classic dual-oscillator mono synth. – Vintage Roland hard case. “I used this in the 1990s for a few home recordings, but not really much since then. I’ve just cranked her up and she’s working perfectly… I’m tempted to keep her because the sounds are so evocative and emotional, however, I no longer have a home studio and can’t justify holding onto her any longer. I hope someone else will have as much fun with her as I did! 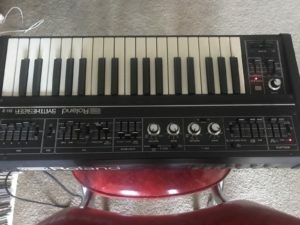 “Up for sale is the classic ROLAND SH-2 Vintage Analog Monophonic Synthesizer. The unit appears to be fully functional, all the keys and knobs and buttons working well, including Sequencer and Arpeggio functions. Last tested, Item physically in fair condition and working properly. Sie bieten hier auf eine Gebrauchte Roland SH-2 Synthesizer. die auch zu 100% Funktionsfähig ist. ” Unit works great. there are no broken parts. The finish looks as good as it did in the 70’s except for one area of chipped paint (see the photo above the name ROLAND). 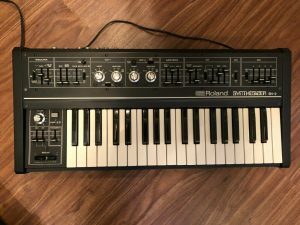 “Up for sale is ROLAND SH-2 vintage analog synthesizer, one of the most popular monosynth from Roland’s classic SH series. The unit appears to be fully functional, all the keys and knobs and sliders working fine as I tested. No noticeable noise on the knobs and sliders. Cosmetically the unit is in beautiful condition as you can see. There may be some very minor wear and marks here and there, but nothing major at all and obviously have been looked after very well. Very nice near mint condition. I’m including plenty of pictures so you can see exactly how it looks. Comes in original Roland Hard Case as shown. “This SH-2 is in perfect working and very good condition!! ” This SH-2 is in perfect working and very good condition!! 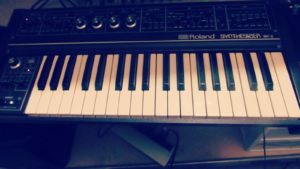 Zum Verkauf steht hier ein Roland SH-2 analog Synthesizer. 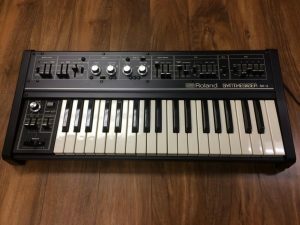 Dieser Synth gilt als der beste Roland Monosynth und einer der absolut besten Synths überhaupt. Kein vergleich zur 101 – der SH-2 hat nicht nur 2 Oscillatoren, sondern ist vor allem komplett diskret aufgebaut. Fetter, direkter und angenehmer zugleich geht nicht. Zustand: Er funktioniert sehr gut. Das Audiosignal ist extrem laut und rauschfrei – besser als bei jedem anderen vintage Synth, der in meinem Studio war. Das verbaute Midi-Interface läuft tadellos – die zweite Midi-Buchse ist ein Midi-Thru. Also sehr praktisch, wenn man mehrere Synths hat. Alle Funktionen laufen einwandfrei und es gibt kaum Knackser beim Fader schieben. Der Synth ist in wirklich gutem Zustand für sein Alter. Der 2. Wellenform Regler wackelt ein kleines bischen und die Tastertur macht bei längerem nichtgebrauch die typsichen Triggerfehler – die sich aber geben. Typisch 70er Roland. Die Beschriftung und die weißen Tasten der Klaviatur sind nicht mehr weiß, sondern beige farben durch das hohe Alter. “Here’s an excellent example of this classic synthesizer. There’s tons of info online about these, so I’m not going repeat all that here.